In the past I had believed that the Gaelic peoples had left Egypt via North Africa (Libya) and sailed from there to conquer Spain. However rereading the original account in the Lebor Gabala Erenn they tell of a different journey on their way to Spain. This account tells of the Milesian Gaels leaving 4th century Egypt via the Red Sea and the south. However some of the Royal House (Godoli) may have stayed in Egypt and Libya until the 3rd century when they also left, under the leadership of Princess Tia (Tamar X Guardian of the Stone of Jacob) the daughter of Pharoah Ramses X (340-296 BC) of Egypt (Kemet), to join the rest of the Milesian Gaels (Habiru) in Spain via North Africa and the Mediterranean Sea. In Spain Princess Tia married her relative the Milesian warrior-king Bile. The Gaels belonged to the Davidic House of Nathan. 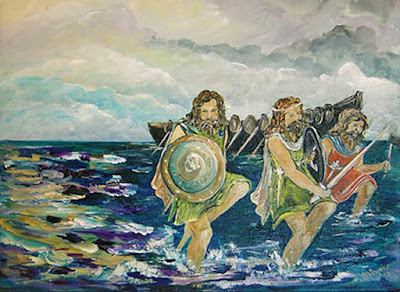 In the Milesian Gaelic accounts the earlier group left Egypt under the leadership of the brothers Prince Nilius (Noah) the Milesian or Miletian (Mil or Milesius) and Prince Ercha via the Red Sea (Indian Ocean or Erythrean Sea) for Taprobane (called by the Gaels Deprofane). Taprobane was close to the original Gaelic homeland in Kedar (South-West Western Australia and the now sunken area of the Naturaliste Plateau) which they had left for Tehama and Egypt in the 7th- 6th centuries BC. Nilius was married to Pharoah Ramses III (Nectanebo I)'s daughter Isnet (called Asenath/ Osnat by the Hebrews and Scota by the Milesians). In the Gaelic accounts the Pharaoh is called Nectenibus. On their legendary journey to the North the Gaels (of R1b L21 ydna) had to go past India (which meant the area of Australasia (Third India) and Indonesia (the Second India) and Aissia (Asia or China) and Scythia (Russian Siberia) until they reached the Northern Sea (Arctic Ocean) and then on the northern Atlantic Ocean until they reached the area of ancient Scandinavia (then a separate island). They went on a trip northward and then probably around Greenland before heading back towards Scandinavia and the White Sea. They sailed down through the marshy waterway that separated Scandinavia from Europe in to the Baltic Sea (Aegean) past Thrace (Tracia or Finland and Norway) on the north and with Germania (Poland and Germany) on the south side. After heading northward past Sweden (Gothia) in the Baltic Sea. they landed in Denmark (Dacia) where they stayed for a short while. They then headed into the North Atlantic Sea known as the Sea of Helle or the Hellespont Sea in the northern parts and the Sea of Toirrion (Torrian) in the southern parts. They sailed to an Island in the Atlantic called Tenedho (possibly the sunken lands of Lochlann) before reaching Central America (Crete). Central America or Crete (Atullia) was also a separate island from North and South America. They then left Central America via the Scilly Isles (then one bigger Island) and past southern Britain and France to Spain where they settled for a number of years before they conquered Britain and Ireland in the 2nd century BC. They had settled in Taprobane (Deprofane) for a time before being driven out by either the Rubani of Australia or the Parthians of R1a Z283 ydna. They then moved to Scythia (Russia) where they settled for a time (driven out by the Ephraimite R1a Z283 Scythians or Slavs) before moving to Scandinavia where they also settled for a time. The Milesian Gaels were then driven out of Scandinavia by the Assyrians (Assir) of I ydna before moving on to Central America where they also settled for a time. They were then driven out of Central America by the Rubani or Rhodan R1b U152 and Frisians (Zebulonites). They then conquered northern Spain from the Frisians (R1b U106 ydna) and their brothers the Lombards (R1b U106) and the Rubani Celts (R1b U152). The great journey of the Milesian Gaels from Egypt to Spain via Taprobane probably took nearly thirty years. They (Habiru) left Egypt (except for the Royal House of the Godoli) in the reign of Ramses VI (Nectanebo II) around 330 BC and they arrived in Spain around 310-300 BC. The Lebor Gabala Erenn states clearly that they left Egypt for Taprobane after Alexander the Great was in Egypt. He was in Egypt from 332-1. There is a legend that Alexander the Great was the biological son of Nectanebo II with Queen Olympias of Macedonia. He was visiting Macedonia as a Prince of Egypt when he was about 19 years old. If this is so then Alexander the Great would share with Ramses III (Nechtanebo I) the haplogroup of E1b1a. After 295 BC the Royal Princesses and the Godoli left Egypt and joined them in Spain taking the Stone of Jacob with them. The Habiru's longest stay on their journey to Spain was in Scythian Russia where they traveled the waterways and rivers in their ships. At this time the weather was warmer as the Arctic Ocean (Northern Sea) was navigable and Siberia (Scythia) was also much warmer and fertile. In about 535-40 AD this warm period ended with the return of the Ice and Snow caused by the asteroids that hit northern Australia. This also brought the Arthurian Age to an end. The next warm period occurred later in the Middle Ages before ending in the 14th century in the northern Hemisphere with the Little Ice Age. However it is possible (taking into account tree ring evidence can be faulty as one tree ring does not always represent one year but due to certain weather events there can be more than one ring for a year) that the warm period lasted until about 1530 when the cataclysmic events hit the Southern Hemisphere. In fact there is historical evidence that the Greenland Norse culture ended suddenly in the early 16th century. Scholars state that beginning in 1530 the weather in Britain became much more severe for the next 30 years and was the reason glass in windows became so popular. 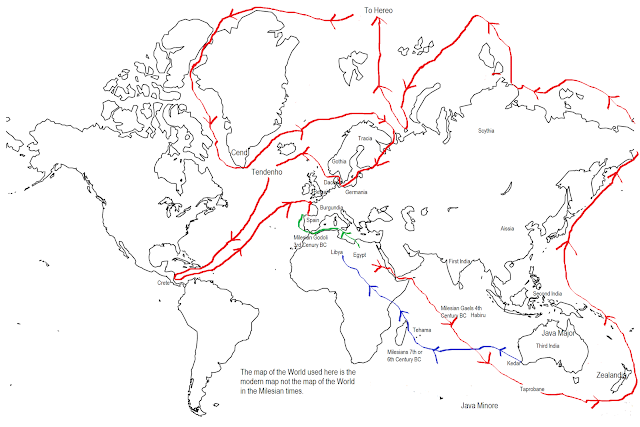 The cataclysmic events may have unfolded between 1520-1535 allowing for the removal of peoples from the southern part of the Indian Ocean into Australia and South East Asia. In England in 1527-8 enormous amounts of rain fell more than in 1257-8 when other cataclysmic events in the Southern Hemisphere (on Lombok Island in Indonesia) affected the weather in the northern Hemisphere. The Milesian ancestors were the Davidic House of Nathan who in the 9th century BC left Northern Israel for Kedar in south western Western Australia which was part of an Egypto-Phoenician-Israelite Colony. Some of them (Militia of Nathan) returned to the Middle East in 690 BC where they sailed up the rivers of Russia (Scythia) and fought in the Trojan War in Finland (Tracia) and they later established a colony at Miletus and others around the Black Sea. They also established a colony in Libya/ western Egypt around 520 BC in the reign of Pharaoh Siamun (Solomon) Aramatleko of Kush (Nubia)(r.526-506) under the leadership of Shoshenk (Elmadam) Prince of the Ma (Mu/ Meshwesh/ Kedari/ Libyans/ Milesians/ Tehenu) the son of Her the Ruling Prince of Kedar and Mu. They also settled on the ancient lands of the Indian Ocean and later the remnant from Kedar moved to Aram-Tehama (Madagascar but much larger small continent) the homeland of St. Joseph of Arimathea. At this time there was a waterway from Mozambique via Lake Nyasa, Lake Tanganyika, Lake Victoria and the Nile that the Milesians sailed to Egypt from the their colony on Aram-Tehama. In order to understand the Gaelic description of their journey one needs to know that the Red Sea (Muir Ruaidh) was the Indian Ocean, the Muir nIndeeda referred to the Pacific Ocean, the Muir Immechtrach to the Northern or Arctic Ocean, Mara Caisp is the Laptev Sea, Western Ocean (ocian siar) is the Atlantic Ocean, the Muir Luis (Libyan Sea) the White Sea, Mara Poinut is the Barents Sea, Muir Egeta (Aegean) is the Baltic Sea, Muir nElispoiantidha (Hellespont) is the North Sea, Muir Toirrian siar is the western Saragasso Sea. The Black Sea (Cimmerian Sea) of the Milesians is the modern Kara Sea. The Promontory of the Riphi Mountain in the north may have been Svalbard Island or maybe somewhere further in the hidden north. It was in Scythian Siberia (Cimmeria) on the coasts of the Kara Sea that the Milesians settled for a number of years. The modern Black Sea is called Karadeniz in Turkish and the Milesians called it Euxine Sea (Hospitable Sea) where the Miletians also established colonies. The Gaelic accounts refer mainly to the northern Kara or Black Sea and Scythia in Siberia rather than the southern Black or Euxine Sea and European Scythia.
" Thereafter they came upon the Indian Ocean. They sailed to Trapobane Island and they stayed there a month. Then they went around past India (Australia, Zealandia and South East Asia) and Aissia (China) and then around Scythia Clochaigi (Siberia) outward on the Pacific Ocean northward until they reached the Arctic Ocean to the estuary of the Laptev Sea...Thereafter they sailed...upon the Ocean westerly until they reached the White Sea and Choronis and upon the surface of the Barents Sea; and they sailed past the promontory of the Riphi Mountain northward. There it is that Caicher said to them "Inill aro, ni anfem de" which means "we have no rest till we reach the noble island Hereo". Thereafter they sailed towards Cend for a year upon the Atlantic Ocean until they reached the Meotachta Waterway (marshes) in the north (between the White Sea and Gulf of Finland) then going past Germania (Germany and Poland) alongside Tracia (Finland and Norway) until they reached Dacia (Denmark). They stayed for a month in Dacia which is northward from the Baltic Sea past Gothia (Sweden), then upon the North Sea (Hellespont) to the Island of Tenedho (Lochlann), then westward upon the Saragasso Sea until Central America (Crete). Then back via Sicil (the Scilly Island) to Belguint (southern Britain) and Breguint (France) to the Pillars of Hercules facing Gatian (Galicia) on the third corner of Spain." Some ancient sources speak of three columns of Hercules and the Lebor Gabala Erenn speaks of these columns or pillars of Hercules in the context of a three-cornered Spain. One of the pillars was at Gilbraltar, another probably under the sea on land now fallen under the Ocean and the third the Tower of Hercules in Brigantia in north eastern Spain near Coruna (it is possible that original pillar or tower of Hercules was also further out on land now fallen under the Sea). The Toirrian Sea was the one beyond the Tower (Torre) of Hercules and is today called the Saragossa Sea plus the Sea near Ireland . Atlantis is at the bottom of this Sea. In a past blog I speculated that the Egyptus with its Nile river may have been in Northern Scotland now under the Sea in the time of the Battle of Troy and Homer. However studying the Gaelic legends another possibility is that another Egyptus was in fact in Eastern Siberia and that the modern Lena River is the remnant of this new Nile River named for Nilius the Milesian (Miletian) hero. The original Eygptus was a King and Kingdom on Mars, with the return of the descendants of Martian colonists the area in northern Scotland was named Egyptus and the Greeks renamed Kemet (Kumat) as Egyptus and its River Iteru or H'pi as the Neilos (Nile). The Milesians after leaving Egypt in the 4th Century BC named the area of Scythian Siberia near the Laptev (Caisp) Sea as Egyptus and its River the Lena they called the Nile. 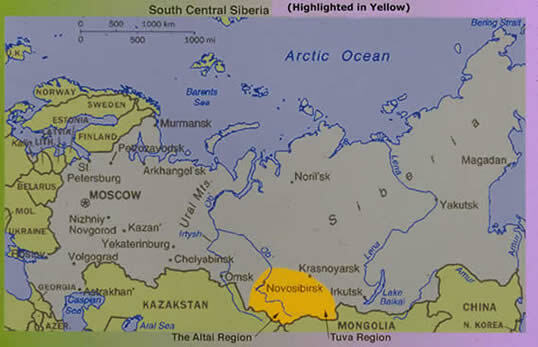 Before the Ice Age hit in around 540 AD this area of Siberia was warmer and fertile with a huge River System that later became blocked by the Ice and this area had been formerly populated by huge mammoths. Gaelic legend tells of the Habiru Amazon Queen Cessair a granddaughter of Nilius (Noah) who left Scythian Egyptus via the Laptev Sea (Caisp), through the Kara (Black or Cimmerian Sea) and then into the Atlantic Ocean or Toirrian Sea. It would seem she and her followers arrived at the Pyrenees and entered Spain over them to join the other Habiru Milesians already settled in Spain. The Milesians settled for a time near the Gulf of Ob and sailed down the Ob River to trade. This area was known as Cimmeria as it was adjacent to the Cimmerian Sea (Kara or Black Sea). 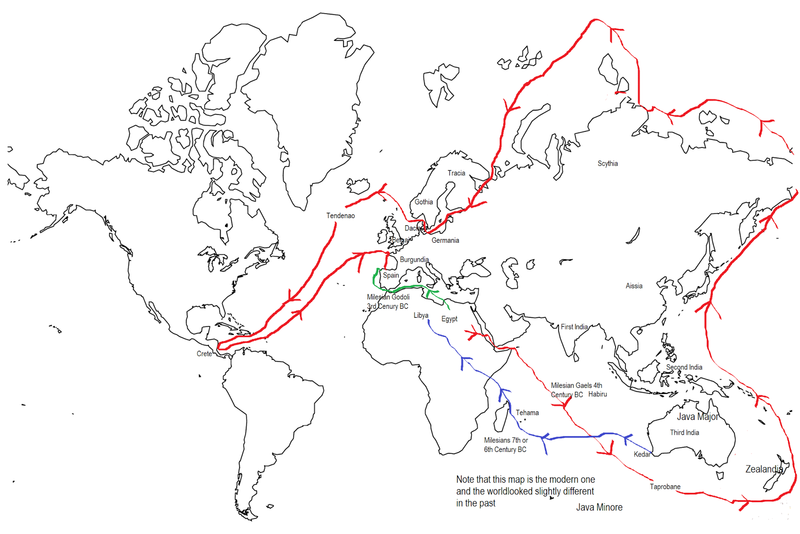 The amazing journey of the Milesians demonstrates the flow of the oceanic currents that circled the globe in the period of the 4th -2nd centuries BC when the map of the world looked somewhat different to today and the seas were lower than today.Today the bulk of the people of England, Wales, Scotland, Northern Ireland and Ireland are the descendants on the male line from these intrepid warriors and sailors. From the branch of the Militia of Nathan that settled in Jerusalem and re-embraced Judaism in the reign of Josiah descended the Babylonian Exilarchs and in the 2nd century BC one of these Exilarchs called Joseph established a mining settlement in Britain among the Cymru branch of the Milesians in Somerset. His son Isaac married a daughter of one of the Irish Milesians from whom descended St Joseph of Arimathea whose father Mar Chunya Eleazar (Eli) of Babylon and Mara became a Jewish Exilarch of Aram-Tehama among communities of Milesians who had reembraced Judaism. The descendants of Mar St. Joseph of Arimathea who became the Jewish Christain Exilarch (Rosh Galuta) of Britain belong to R1b M222+ branch of the Kedarite/ Milesian House of Nathan of R1b L21. R1b L21 is found also in Spain, Scandanavia and Western Europe in smaller numbers than the British Isles as well among certain Eastern European Ashkenazi Jewish families. Testing of ancient remains in the Basque country of Spain at La Hoya demonstrates that the Milesian female lineages belong mainly to H1, H3, J1c and U5 mt-dna. However U5 comes from inter-mixture with the women who were already in Spain from the Atlantean settlers. J1c most likely became part of the Milesian population from their time in Siberian Scythia where they interacted with the Lost Tribes who were in Exile there and where J1c first occurred among the R1a y-dna Manassehites, the N y-dna Naphtalites and the Q y-dna Benjaminites. J1c mt-dna was also brought into Europe by the movements of these tribes when they moved West as well as that brought by the Milesians around 300 BC. The modernists date the settlement at La Hoya from the 15th century BC till 300 BC. I would however date it from around 300 BC until around 500 AD. The settlement being destroyed sometime after the Romans left Spain in 472.